Annie has a Master of Public Health (MPH), PhD in Foods & Nutrition and BS in Biomedical Engineering, all from Purdue University. She has been working with orphaned & vulnerable children of Southern Africa & designing service-learning programs for US college students & young professionals since 2007. Later, she lived in Swaziland, Africa & worked for Baylor College of Medicine's Pediatric HIV Clinic in Mbabane as a Visiting Scholar. 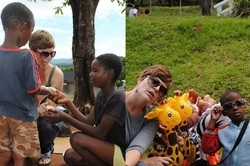 During this time, she facilitated the development of a national protocol on infant feeding pertaining to reducing the transmission of HIV/AIDS, volunteered at an HIV orphanage, & worked closely with the University of Swaziland's Nursing & Community Health department to assist with a nationwide community health needs assessment. Kait received her Bachelor of Science in Art Education from Indiana University. After graduation she headed west and taught a multicultural visual arts curriculum at an elementary school in southern Nevada for 6 years. Wanting new challenges and a change of scenery, she moved back to her hometown of Indianapolis in 2007 and began working within the nonprofit sector. Kait believes art can be related to all aspects of learning and is an excellent tool for understanding other cultures and customs. Fikeveni Dlamini was born and raised in the Kingdom of Swaziland. After completing a degree at the University of Swaziland in Agriculture, he continued his studies at Vincennes University and Purdue University in Environmental science. He now works and resides in Lafayette, IN. He has been helping with GHFP programs long before it's official conception and has delivered crucial advice in the past 4 years suggesting ways to implement difficult programs and networking with local Swazi people who have been able to facilitate the organization's mission. His knowledge of the social aspects of his people has helped GHFP interact in ways that are culturally acceptable. Fiks is able to build on ideas due to his knowledge of what is feasible on the ground in Swaziland. His time, knowledge and passion to help the orphaned and vulnerable children in his Kingdom are greatly appreciated. Hyrum LaTurner holds a masters degree and PhD from Brigham Young University and the University of Chicago, respectively. He holds experience in both administration as well as education with teaching experience at Kankakee Community and his current position as an assistant professor of Humanities at Prairie State College. Dr. LaTurner is excited to use his connections in academia to build GHFP's network of volunteers. He is currently engaging students in fundraising, awareness building, and recruiting for future service-learning trips to Swaziland. He is passionate about engaging local youth in our fight against poverty and looks forward to serving as the GHFP board Vice President. Nicole Herlevic brings an eclectic background to the role of GHFP Treasurer. She received her B.S. in Business from Indiana University and has since acquired over eleven years of professional accounting experience in a variety of roles during her time residing in the Chicagoland area. Nicole started her career with a boutique CPA firm specializing in governmental and NFP accounting, where most of her time was devoted to auditing suburban elementary school districts. She then ventured into the corporate accounting sector and eventually settled into a senior role in the finance department of a corporation specializing in the acquisition and management of outpatient surgery centers. She served two years as Treasurer on her condominium’s HOA Board, which, as a member of its first elected Board, allowed her to gain valuable experience helping an organization expand in its early stages of development. Although new to the non-profit arena, Nicole looks forward to contributing her financial skill set to the Board and her unwavering enthusiasm to the GHFP mission. Megan Kaser has been involved with GHFP since her first trip to Swaziland as an undergraduate student at Purdue University. Since that time, she played a crucial role in forming the Purdue Student Chapter of Give Hope, Fight Poverty. She served as president during the first year and focused on building a strong foundation for future years. She recruited all over campus, organized fundraisers for the club and for the non-profit, and built relationships with other clubs. The greatest accomplishment though was recruiting other extremely motivated individuals who were willing to continue to support the mission of Purdue-GHFP. Now, as a graduate, she continues to support GHFP through her role as a board member, managing volunteer alumni relations, and throwing fundraisers to insure program sustainability. Beth Pychinka received her B.A. in History from Indiana University. She completed a secondary education program from IUPUI, and she earned her master’s degree is from Ball State University. She comes to GHFP with an extensive background in public education. Beth has worked in high needs schools teaching high school English, and she currently contributes to public education as a high school administrator. Beth will use her extensive career in education to help bolster GHFP's education programs in rural eSwatini!